This was sent to me from W:. Paul Davis and thought it was great. If you have any noteworthy information or news, please send it to me and I will be glad to enter it here - Editor. Getting back to school, I remember a teacher that I had. Now I only went, I went through the seventh grade. I left home when I was 10 years old because I was hungry. (laughter) And .. this is true. I worked in the summer and went to school in the winter. But, I had this one teacher, he was the principal of the Harrison school, in Vincennes, Indiana. To me, this was the greatest teacher, a real sage of..of my time, anyhow. 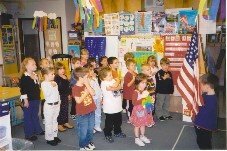 "I've been listening to you boys and girls recite the Pledge of Allegiance all semester and it seems as though it is becoming monotonous to you. If I may, may I recite it and try to explain to you the meaning of each word? Pledge - dedicate all of my worldly goods to give without self-pity. To the Flag[of the] - our standard, Old Glory, a symbol of freedom. Wherever she waves, there's respect because your loyalty has given her a dignity that shouts freedom is everybody's job. United - that means that we have all come together. States [of America] - individual communities that have united into 48 great states. 48 individual communities with pride and dignity and purpose, all divided with imaginary boundaries, yet united to a common purpose, and that's love for country. and to the RepublicFor Which It Stands - Republic ... a state in which sovereign power is invested in representatives chosen by the people to govern. And government is the people and it's from the people to the leaders, not from the leaders to the people. One Nation - One Nation ... meaning, so blessed by God. With Liberty - which is freedom, the right of power to live one's own life, without threats, fear, or some sort of retaliation. And Justice - the principle or qualities of dealing fairly with others. For All - For all ... which means, boys and girls, it's as much your country as it is mine. We all know the effects (and after-effects) of beer. But lifting a glass of cool liquid to your mouth on a scorching hot day, have you ever stopped to consider the processes and ingredients involved in making it? Well maybe not but here is the answer anyway! Simply, beer is a fermented combination of water, barley, yeast and hops. The major variation in any beer is the type of yeast used in the fermentation process. Let's look at the properties of this beverage. Water is the main ingredient of beer. In the past, the purity of the water influenced the final result and was specific to the region of the earth from which it came. Today, water is filtered of these impurities, although pure water supplies are still ideally preferred by elite brewers. Barley malt is an extremely important ingredient in beer as it is the main source of fermentable sugar. Many new breweries use barley malt extract, in either syrup or powder form, as this form ferments much quicker. It also contains many minerals and vitamins that help the yeast to grow. Without yeast, beer would not exist. Yeast is a unique single cell organism that eats sugar and expels alcohol and carbon dioxide, two of the more recognizable ingredients of beer. Yeast comes in several variations, of which there are two major categories that determine the type of beer produced; Ale yeast and Lager yeast. If yeast alone were used the beer would be extremely sweet and therefore another ingredient needs to be added to reach the final product. Hops are the flowers of the hop plant, a climbing vine plant that grows well in many differing climates. Hops contain acids which add bitterness to beer. Adding bitterness to beer helps to balance the sweetness, as well as acting as a natural preservative. Add more hops to the mixture and you will get a more bitter taste. This kind of beer is extremely popular in Britian and is simply referred to as "Bitter" (the original names are always the best!). Variations of these ingredients create different tasting beers as well as having an affect on the alcoholic content. When making your own beer many good resources are available which provide home brewing kits. It is important to read the ingredients of the packets in order to ascertain which has the best mixture according to your needs. One quick tip which many home brewers fail to adhere to is this: "Use fresh still water"! Many have often sought information on how to make beer and the basic homebrewing equipment is not very expensive you can get what you need, for as little as $100. In order to start making beer, you will need the following: A brewpot, Primary fermenter, Airlock and stopper, Bottling bucket, Bottles, Bottle brush, Bottle capper, and a thermometer. In addition you can even use items from your kitchen to aid in the beer making. A breakdown of all the equipment is as follows: Brewpot A brewpot is made of stainless steel or enamel-coated metal which has at least 15 litre capacity, but it's no good if it's made of aluminum or if it's a chipped enamelized pot, (these will make the beer taste funny). The brew pot is used to boil the ingredients thus begins the first stage of beer making. The primary fermenter is where the beer begins to ferment and become that fabulous stuff that makes you so funny and charming. The primary fermenter must have a minimum capacity of 26 litres and an air tight seal it must also accommodate the airlock and rubber stopper. Make sure the one you buy is made of food-grade plastic, as it wont allow the bad stuff in or let the good stuff out. This is a large, food-grade plastic bucket with a tap for drawing water at the bottom, it needs to be as big as your primary fermenter, because you need the capacity to pour all the liquid from your primary fermenter into a bottling bucket prior to bottling up. After fermentation, you place the beer in bottles for secondary fermentation and storage. You need enough bottles to hold all the beer you're going to make, the best kind of bottles are solid glass ones with smooth tops (not the twist-off kind) that will accept a cap from a bottle capper. You can use plastic ones with screw-on lids, but they arent as good for fermentation and dont look as well. Whether you use glass or plastic bottles, make sure they are dark-colored. Light damages beer, i would recommend green or brown bottles. This is a thin, curvy brush which is used to clean bottles because of the the shape of the brush it makes it very affective at getting the bottle spotless. We haven't even gotten into how clean everything has to be, but we will, and the bottle brush is a specialized bit of cleaning equipment that you will require in order to maintain your bottle kit. If you take buy glass bottles, you will need some sort of bottle capper and caps, of course, and you can buy them from any brewing supplies store. The best sort of bottle capper is one which can be affixed to a surface and worked with one hand while you hold the bottle with the other. This is a thermometer which can be stuck to the side of your fermenter, they are just thin strips of plastic which are self adhesive, and can be found in any brewing supplies store, or from a pet shop or aquarium. Not everything costs money though even some household equipment can be used. So there you have the ingredients and the method to make your home brew, all you need now is to get yourself a beer making kit and your on the way to beer heaven.